Even though I haven't been avoiding spoilers, this episode paid off to see in full. I'm very glad New Lars is not totally transformed and still has some Old Lars hangups. BUT while I can believe he stole that cape (Jasper had a cape), where would he get snazzy white pants, boots and turtleneck? Are there gems who wear such detachable garments???? These are the important questions here!!! Also his rickety "that" ship was cool, with the "bingo bongo" and the NO on incoming missles. 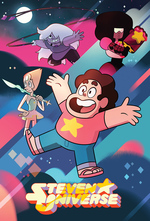 And just generally I loved Emerald, loved the Off Colors, loved this expansion of the Gem storyverse. I love the Captain Harlock cape. I thought they were joking by dressing him as Harlock in the promos, but no, he's fully committed to the look. I think Rule of Cool is sufficient to explain Lars's new uniform, but if you really need an explanation just assume it is made of silk from Fluorite's spinnerets. Yeah, I bet Flourite knits. She strikes me as a knitter. Just get some white fibre, get the poly party onto it and bam! Stylish. It's nice that I don't have to dance around the Captain Har-lars stufff anymore! that was so much fun! I want a whole spinoff of the Offcolors! When the SDCC clip came out and everyone went nuts with the Captain Harlock direction for Lars' character (which wasn't on the list of things any of them expected they'd do with surly, fast food worker Lars), fans started joking about a fake cartoon show called Lars of the Stars, about a pink-haired space captain and his rag-tag crew of spacefaring misfits and their interstellar journey to escape a ruthless space empire, searching for a world they could call home. Some fans started inventing plots for this show, and episode titles, and there's even a subreddit for it, which is depressing to read now because some well-meaning folks tried to reconcile all the various injokes into what could be a cohesive whole, but the gag petered out right around that time, unfortunately (it's not like they had a lot to work from at that point), and the sub is largely dead, but not before they created some awesome stuff, like a bunch of shipping cartoons featuring Lars and Emerald, who, fans noticed, might be a bit sweet on Lars. (Did you notice, in the full episode, how she inartfully danced around the question of what exactly she was sparing?) The possible chemistry between Emerald and Lars even got a fan name: The Fastest Ship. There's a post taking about what had been determined about the show, and also an episode list. I was expecting that the care package would contain some ube cake, but maybe it doesn't travel well? we need to see a variety of materials exposed to the vacuum(?) of pink hair travel. maybe cake expands and pops? It's unclear what the air inside Lion's mane is, other than people instinctually refuse to breathe it. This is actually pretty odd, since you'll continue to breathe normally in an oxygen-free atmosphere and won't notice anything wrong until it's too late. Maybe it's high in carbon dioxide, which triggers a feeling of suffocation if you breathe it. Or maybe being in Lion's mane feels like being underwater?